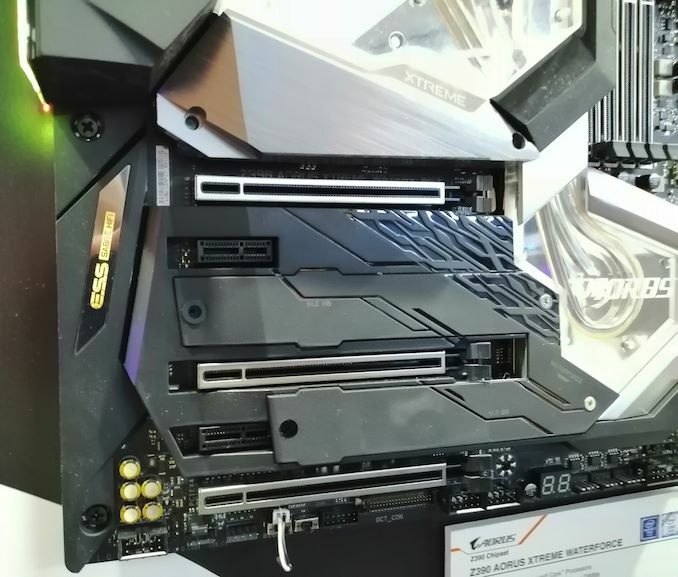 Back in December, GIGABYTE announced its highly premium Z390 Aorus Extreme WaterForce motherboard with an E-ATX form factor, a 10 gigabit NIC and 16-phase power delivery. The biggest feature is a built-in all-in-one monoblock for liquid cooling that comes with the motherboard. If that wasn't eye-watering enough, it has now been listed at Newegg with a price tag of $900. 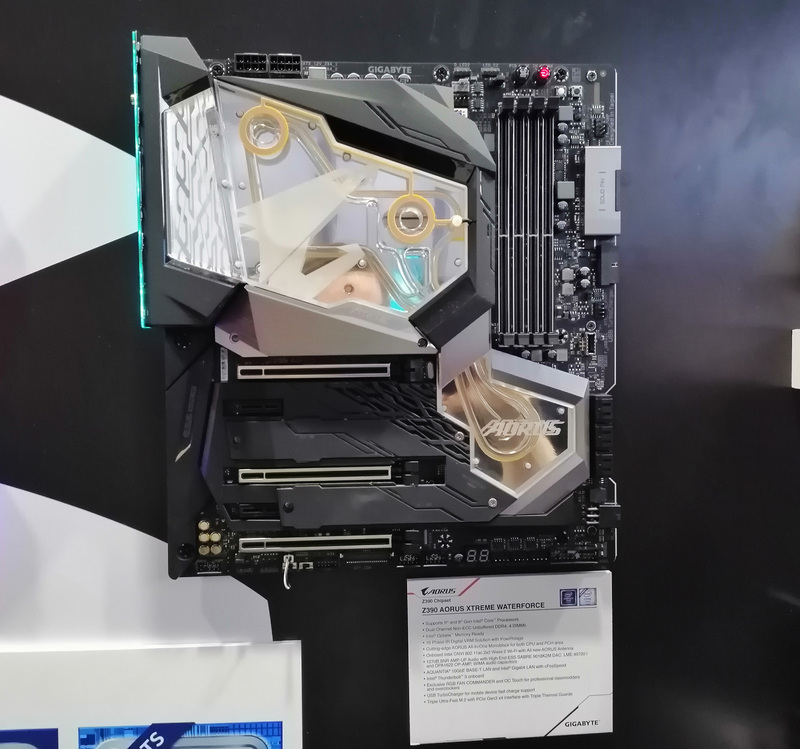 The GIGABYTE Z390 Aorus Xtreme WaterForce has a similar feature-set to the Z390 Aorus Xtreme model with one major difference; the all-in-one integrated monoblock which stretches from the rear panel cover all the way across to the Z390 chipset heatsink. Underneath the RGB monoblock is an LGA 1151 socket and an overkill 16-phase IR Digital power delivery which uses PowIRstages. This power delivery is controlled by an IR35201 running at 8+0 which means each phase is using a doubler. Overclocking is a big focus for this model with a total of two 8-pin 12 V ATX power inputs designed to allow the CPU to pull as much power as it needs. 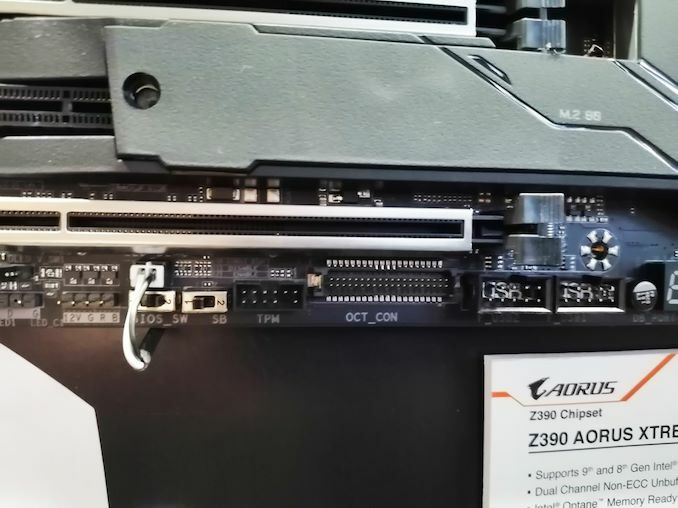 Other distinguished features of the GIGABYTE Z390 Aorus Xtreme WaterForce include dual network controllers with an Aquantia 10GBase-T and Intel networking, paired with a Realtek ALC1220-VB HD audio codec which is complemented by an ESS Sabre 9018K2M DAC and OPA1622 OP-AMP. Making up the storage capability is three M.2 slots and six SATA ports which allow for RAID 0, 1, 5 and 10 arrays to be used. 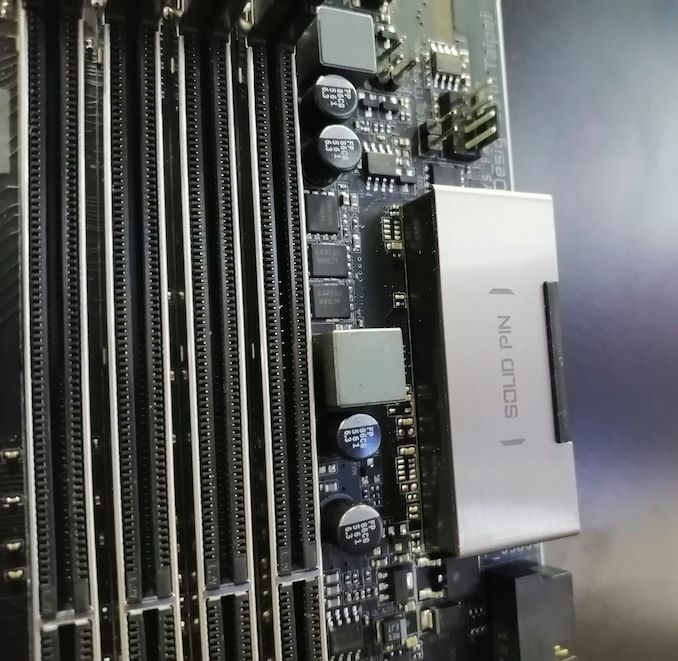 Located around the PCB cover is three full-length PCIe 3.0 slots which run at x16/x8, x8/x8/x4; the bottom slot operates at PCIe 3.0 x2 if a PCIe SSD is installed into the M2P M.2 slot. An additional two PCIe 3.0 x1 slots are located between the full-length slots. Something that is becoming a trend on high-end overclocking motherboards of late is right-angled 24-pin 12 ATX power connectors. GIGABYTE includes a solid pin housing around it to make it visually more appealing to users. The four memory slots have support for DDR4-4400 and have official support for up to 64 GB in total. Following with the extreme nature of this board is a stacked rear panel with not one, but two Thunderbolt 3 USB 3.1 Gen2 Type-C ports. Also present are four USB 3.1 Gen2 Type-A, two USB 3.1 Gen2 Type-A and two USB 2.0 ports. Unlikely that users will spend so much capital to use this with integrated graphics, GIGABYTE has included a single HDMI port and the Z390 Aorus Xtreme WaterForce also benefits from dual LAN with Aquantia 10G and Intel gigabit ports making this a highly impressive offering. There are also two antenna ports for the Intel 9560 2T2R 1.73 Gbps capable Wi-Fi adapter which also offers users Bluetooth v5 compatibility. With a word like Xtreme in the name, it should be expected that overclocking features would be a key part of the feature-set and GIGABYTE has done just that with its flagship Z390 model. The Aorus Z390 Xtreme WaterForce has dual BIOS and a selector switch, a power button, reset switch, clear CMOS and an OC button. A 2x6-pin TPM header for the GC-TPM2.0_S module is present as well as the header required for the inclusive GIGABYTE OC Touch overclocking panel which comes supplied with the board. This is more for extreme overclockers and opens up plenty of options as well as slow mode, frequency adjustment buttons and allows for an additional six fans to be installed. Included in the bundle is an Aorus RGB Fan Commander which has eight 4-pin connectors, eight RGB LED headers including support for addressable RGB LEDs, two external temperature sensors and two USB 2.0 headers for additional RGB devices. This is magnetic and compact with GIGABYTE suggesting this be installed behind the motherboard tray. The GIGABYTE Z390 Aorus Xtreme WaterForce is listed at $900 on Newegg which makes this the most expensive Z390 motherboard currently on the market. 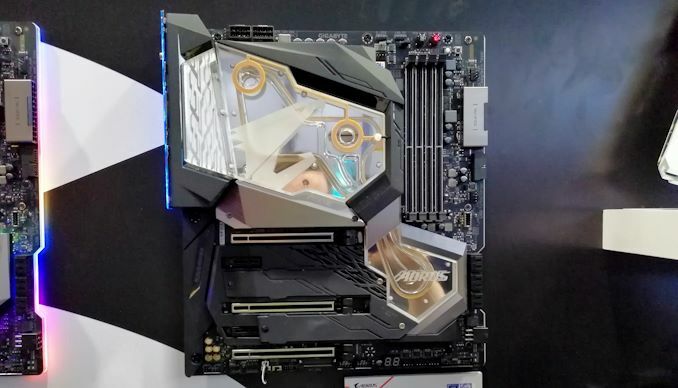 The non-water blocked Z390 Aorus Xtreme model which has the same core feature-set is available for $550, meaning GIGABYTE is charging a $350 premium for the all-in-one monoblock on the Z390 Aorus Xtreme WaterForce.